We will accept groups larger than 12 but please contact hostel directly to arange special bookings. 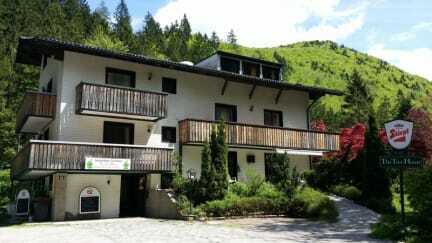 The Treehouse is a small friendly hostel hidden away in the tiny village of Grünau. Sitting in the middle of the Totes Gebirge (the dead mountains) the area around the hostel provides an ideal environment for outdoor activities like hiking, skiing, swimming, or just relaxing. The secluded location ensures a good nights rest, unless you choose to join the fun in the downstairs bar, where guests and locals mingle together to chat or have a game of pool or table soccer. There are mountain bikes for hire for those who want to explore the surrounding area. There is even a tennis and basket ball court that is free to use and in winter time the ski-lifts are only 200m away. We'll supply the ski clothing free of charge. The largest room in our hostel has only 6 beds and each room has its own private shower and toilet. And best of all, a BREAKFAST BUFFET IS INCLUDED in the room price!